Black, red and blue indian inks. Black markers. Me hace gracia porque en realidad las aerolineas deben hacerle un overhaul a los aviones despues de determinada cantidad de horas de vuelo pero actualmente parece que las lineas charteras hacen esto jeje pero para eso desaparecieron Mexicana de Aviación que era la 4ta mejor del mundo. If its off, its save. It’s this sort of shoddy repair work that brought down a Concorde. True . . . though I think in that case, it wasn't their fault, but that of the other plane. *chuckles* The Launchpad McQuack of raccoons? So this airline IS all it's cracked up to be, how about that? As an aviation professional, I got a chuckle out of this. And yes, Speed Tape fixes everything. I think the part that worries me the most, is the Hammer, not the tape. 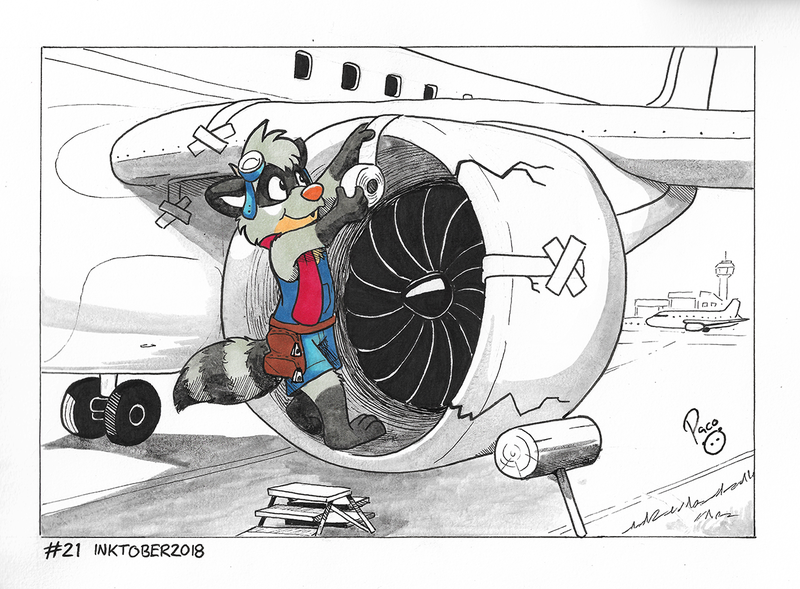 That jet is trash, panda! It's been said many times but the guy who thought to put duct tape on spaceships is awesome. Lovely style, lovely piece. And yes, duct tape is the thing you need if it moves and it's not supposed to. If the problem's other way around, WD-40. Everything else is redundant. I heard once a plane had to crush because of the maintenance workers forgot to remove the tapes from the sensors of the plane after they washed it down so later the pilots got false pieces of information about their height.